Insulated gate field-effect transistors are unipolar devices just like JFETs: that is, the controlled current does not have to cross a PN junction. There is a PN junction inside the transistor, but its only purpose is to provide that nonconducting depletion region which is used to restrict current through the channel. 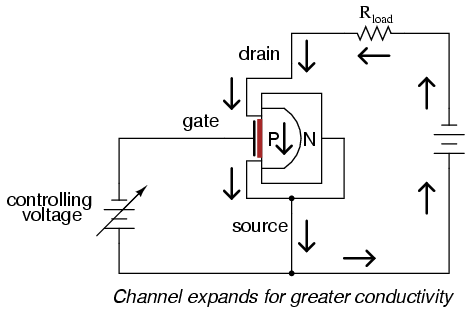 Notice how the source and drain leads connect to either end of the N channel, and how the gate lead attaches to a metal plate separated from the channel by a thin insulating barrier. That barrier is sometimes made from silicon dioxide (the primary chemical compound found in sand), which is a very good insulator. 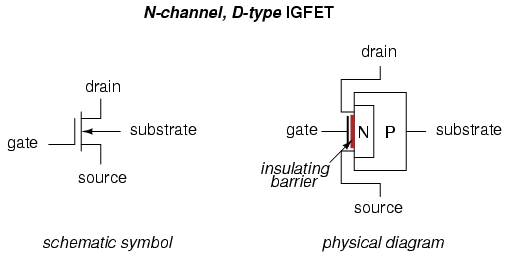 Due to this Metal (gate) - Oxide (barrier) - Semiconductor (channel) construction, the IGFET is sometimes referred to as a MOSFET. There are other types of IGFET construction, though, and so "IGFET" is the better descriptor for this general class of transistors. With source and substrate common to each other, the N and P layers of the IGFET end up being directly connected to each other through the outside wire. This connection prevents any voltage from being impressed across the PN junction. As a result, a depletion region exists between the two materials, but it can never be expanded or collapsed. JFET operation is based on the expansion of the PN junction's depletion region, but here in the IGFET that cannot happen, so IGFET operation must be based on a different effect. Indeed it is, for when a controlling voltage is applied between gate and source, the conductivity of the channel is changed as a result of the depletion region moving closer to or further away from the gate. In other words, the channel's effective width changes just as with the JFET, but this change in channel width is due to depletion region displacement rather than depletion region expansion. The insulated gate allows for controlling voltages of any polarity without danger of forward-biasing a junction, as was the concern with JFETs. This type of IGFET, although its called a "depletion-type," actually has the capability of having its channel either depleted (channel narrowed) or enhanced (channel expanded). Input voltage polarity determines which way the channel will be influenced. Understanding which polarity has which effect is not as difficult as it may seem. 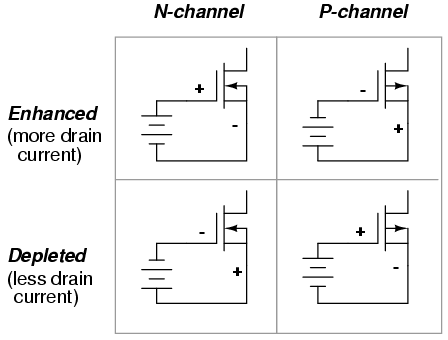 The key is to consider the type of semiconductor doping used in the channel (N-channel or P-channel? ), then relate that doping type to the side of the input voltage source connected to the channel by means of the source lead. 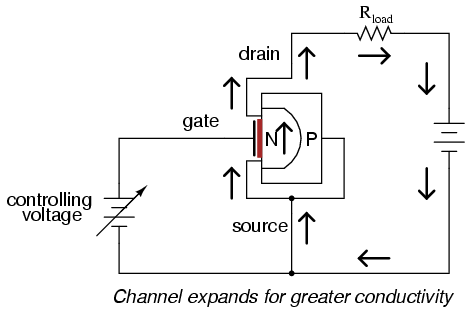 If the IGFET is an N-channel and the input voltage is connected so that the positive (+) side is on the gate while the negative (-) side is on the source, the channel will be enhanced as extra electrons build up on the channel side of the dielectric barrier. Think, "negative (-) correlates with N-type, thus enhancing the channel with the right type of charge carrier (electrons) and making it more conductive." 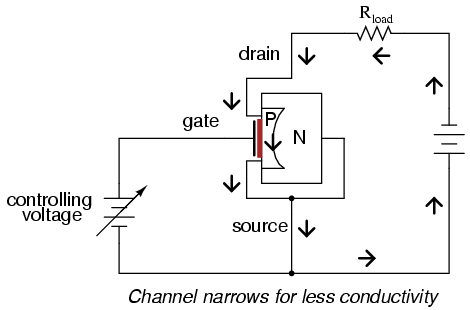 Conversely, if the input voltage is connected to an N-channel IGFET the other way, so that negative (-) connects to the gate while positive (+) connects to the source, free electrons will be "robbed" from the channel as the gate-channel capacitor charges, thus depleting the channel of majority charge carriers and making it less conductive. 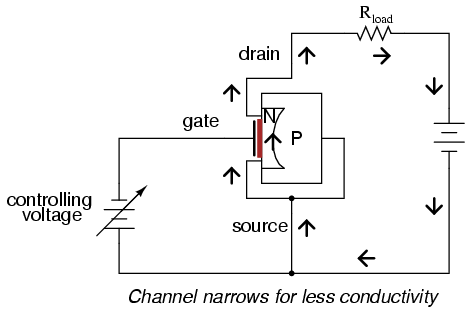 When there is zero voltage applied between gate and source, the IGFET will conduct current between source and drain, but not as much current as it would if it were enhanced by the proper gate voltage. This places the depletion-type, or simply D-type, IGFET in a category of its own in the transistor world. Bipolar junction transistors are normally-off devices: with no base current, they block any current from going through the collector. Junction field-effect transistors are normally-on devices: with zero applied gate-to-source voltage, they allow maximum drain current (actually, you can coax a JFET into greater drain currents by applying a very small forward-bias voltage between gate and source, but this should never be done in practice for risk of damaging its fragile PN junction). 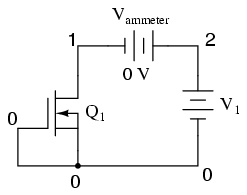 D-type IGFETs, however, are normally half-on devices: with no gate-to-source voltage, their conduction level is somewhere between cutoff and full saturation. Also, they will tolerate applied gate-source voltages of any polarity, the PN junction being immune from damage due to the insulating barrier and especially the direct connection between source and substrate preventing any voltage differential across the junction. Ironically, the conduction behavior of a D-type IGFET is strikingly similar to that of an electron tube of the triode/tetrode/pentode variety. These devices were voltage-controlled current regulators that likewise allowed current through them with zero controlling voltage applied. A controlling voltage of one polarity (grid negative and cathode positive) would diminish conductivity through the tube while a voltage of the other polarity (grid positive and cathode negative) would enhance conductivity. I find it curious that one of the later transistor designs invented exhibits the same basic properties of the very first active (electronic) device.